The Neighbourhood Group – a joint venture by Central Neighbourhood House (349 Ontario) and Neighbourhood Link Support Services – is raising $120,000 to help three Syrian families. Together with volunteers, staff and friends, they’ve collected over $91,000. The two agencies in the Neighbourhood Group have the facilities, the experience and the staff to help their families once they’ve arrived. 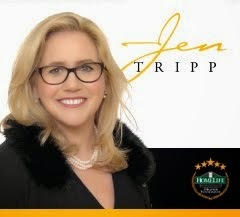 Your support will make this ambitious target possible. Click here to visit CNH’s Facebook page and to learn how to contribute. Last Saturday’s Christmas kick-off at Carlton and Parliament was a warm, enjoyable event. Santa stopped by. There was a horse-drawn wagon, live music, hot chocolate and cookies. The Christmas tree was decorated. Even the Salvation Army showed up with a traditional Christmas collection box. Lots of parents and little kids. Nicely done. 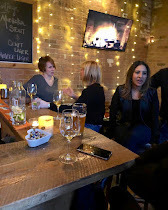 The annual Cabbagetown South Christmas party at Retsina (209 Gerrard E) attracted a good crowd and gave everyone a pleasant chance to catch up on each other’s behaviour. As always, Tom provided an excellent buffet, supplemented this year with Mrs Brown’s homemade (and yummy) Christmas cookies. 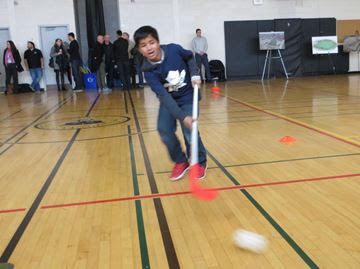 MLSE Foundation, Sentry Investments, 3TO6 and the Kelly Silverstein Memorial Fund have set up the RPAG Grants with $1 million to support activities through the Regent Park Athletic Grounds. The Fund will distribute $250,000 in its first year to projects that assist the participants and build the community as a whole. 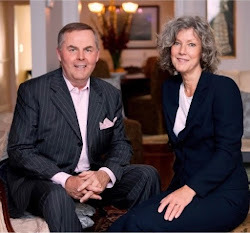 Justin Skinner has written about the new Fund in Inside Toronto – click here to read his story. 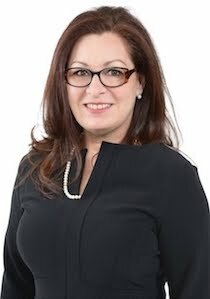 The agency has listed fall and winter activities along the waterfront in its Newsletter including public skating at Sherbourne Commons, walks along Canada’s Sugar Beach, cultural activities at Harbourfront Centre, the Museum of Inuit Art, the sculptures in Ireland Park and the murals in Underpass Park. Click here to read about these suggestions. 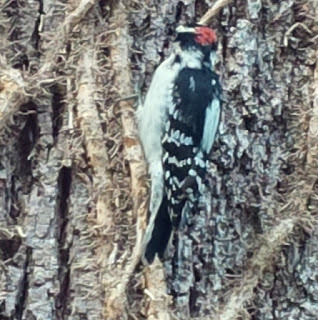 If you have a bird feeder in your yard, save your old Christmas tree. Don’t throw it away after Christmas. 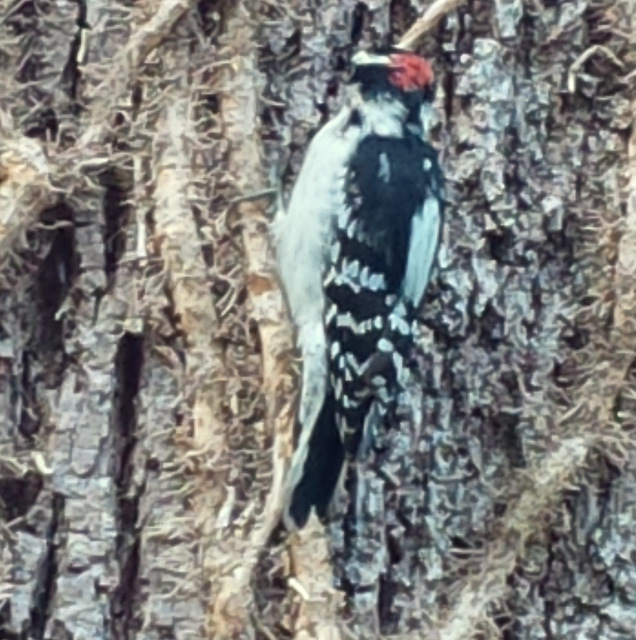 Clean off all the tinsel and decorations and then lean it up against a fence or wall in your yard near your feeder. Your birds will immediately start using it for shelter and safety. 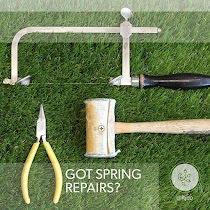 It’s easy to throw out the old hulk in the Spring. The Collective has published its December schedule for classes by Monica Chang, Alan Florence, Jennifer Snowden and Sarah Moore. Please note that David Gluck’s classes have finished. Sarah’s classes are on a day-to-day basis due to a family situation. The schedule lists times, locations and prices. You can read and download it from the Collective’s Facebook page. 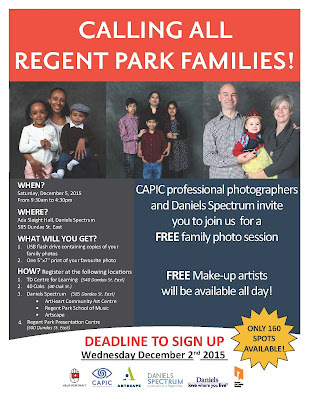 CAPIC professional photographers and the Daniels Spectrum are offering free family portraits for Regent Park residents. 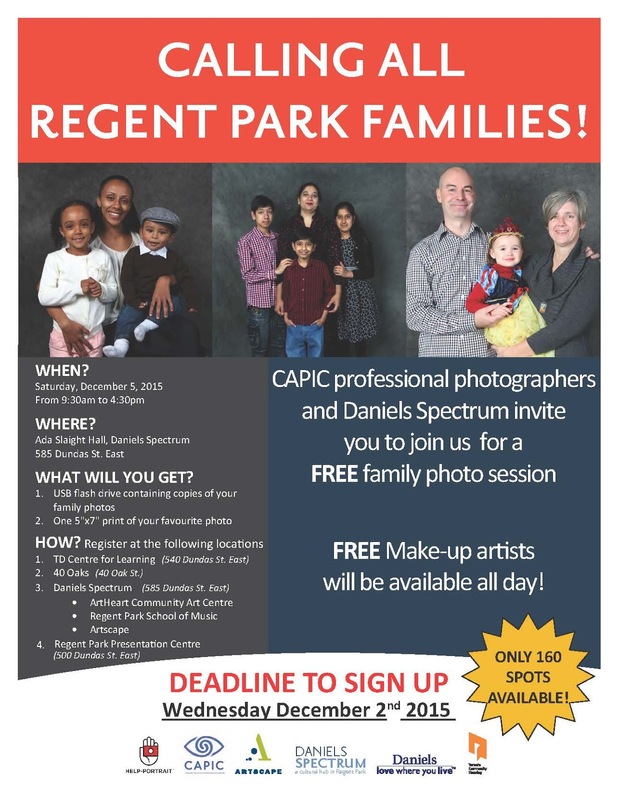 Your photos will be taken at the Ada Slaight Hall in the Daniels Spectrum (585 Dundas E) on Saturday December 5 from 9:30 to 4:30 pm. You’ll get a USB stick with your pictures plus your choice of one printed photo. Only 160 spots available. 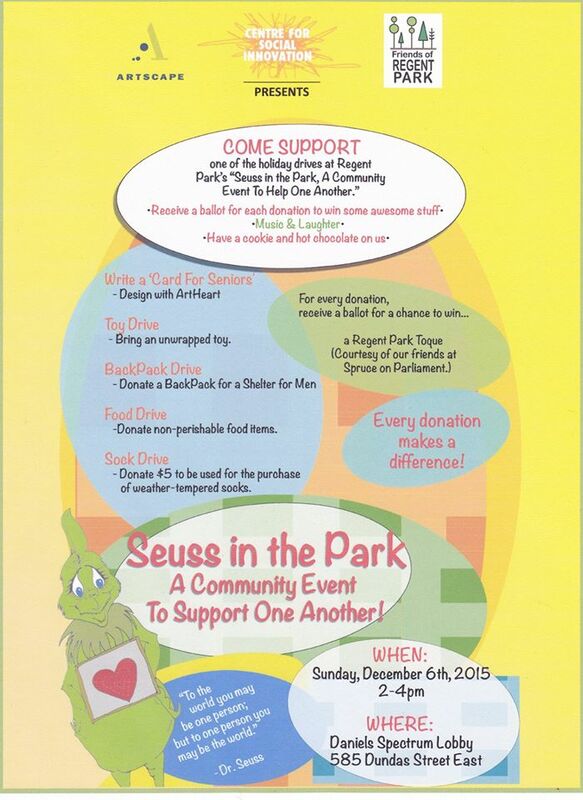 A group of our active local agencies is organizing a day when we can support each other. The drives will include Write a Card for Seniors, a toy drive, a backpack drive for a men’s shelter, a food drive and a $5 sock drive. 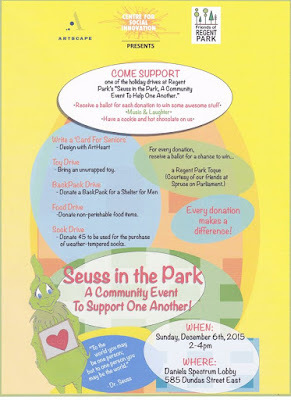 You’ll receive a ballot to win a Regent Park toque (courtesy of Spruce on Parliament), for every donation. Cookies and hot chocolate. 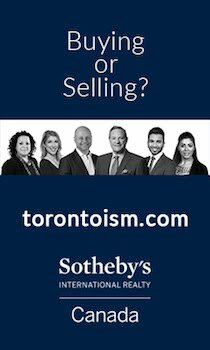 Sunday December 6, 2 to 4 pm, Daniels Spectrum lobby (585 Dundas E). 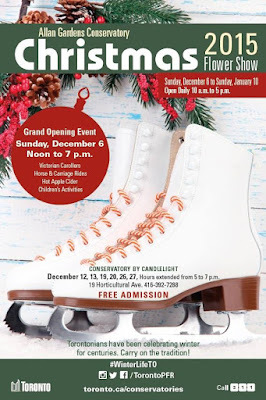 The 2015 Christmas flower show at the Allan Gardens Conservatory (Carlton between Sherbourne and Jarvis) starts on Sunday December 6 from noon to 7 pm. There’ll be a visit by Santa, a horse and wagon for rides around the park, apple cider and games for kids. The show itself will continue to Monday January 11 from 10 am to 5 pm daily. There’ll be special candlelight shows from 5 to 7 pm on the weekends of December 12 & 13, December 19 & 20 and December 26 & 27. Free. 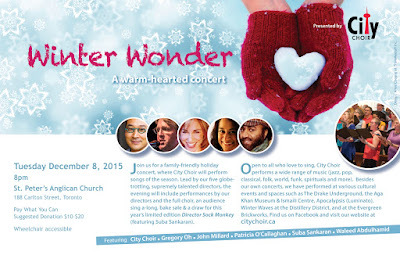 The Choir will sing at St Peter Anglican Church (188 Carlton) on Tuesday December 8 at 8 pm. Five directors will be featured – Gregory Oh, John Millard, Patricia O’Callaghan, Suba Sankaran and Waleed Abdulhamid. There’ll be performances by the full choir, an audience sing-a-long, a bake sale and more. Wheel chair accessible. Pay what you want – suggested donations of $10 to $20 will be appreciated. 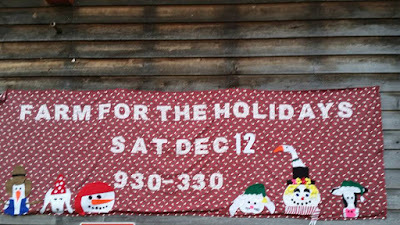 Visit the Farm to enjoy craft making, cookie decorating and treats from the kitchen. Santa will drop around. Saturday December 12 from 9:30 am to 3:30 pm. Please bring a donation of unused toiletries for local shelters. Once again, neighbours around Winchester and Parliament will be carolling and collecting goodies for the St Luke food bank. 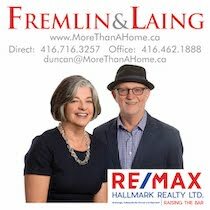 Watch for the group along Winchester, Metcalfe, Carlton and Sumach on Sunday December 13, starting at 7 pm. Last year, they collected over $700 in cash and over 700 pounds of food. If you aren’t on this route or you’re not planning to be home, drop off your donation at 94 Winchester. 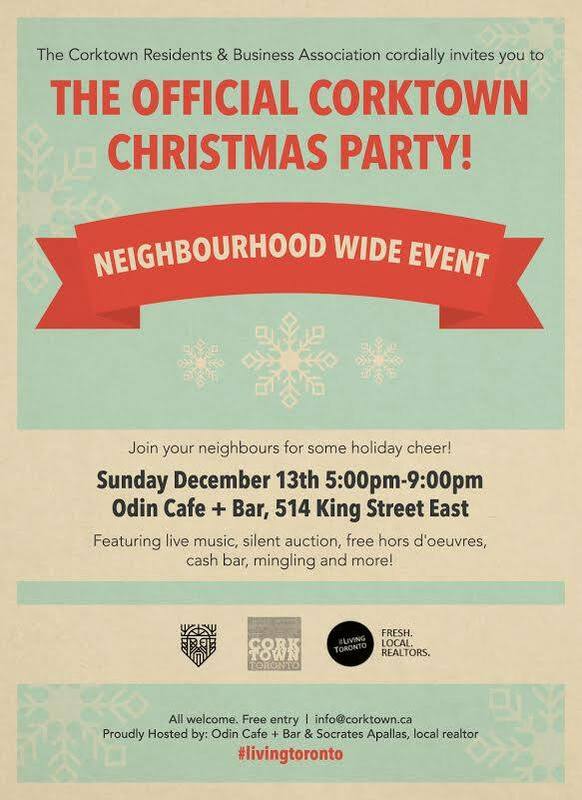 The annual CRBA Christmas party will be held at Odin Café & Bar (514 King E) on Sunday December 13, 5 to 9 pm. 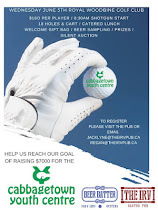 There’ll be live music, a cash bar, food and a silent auction. Every year, we hear and read impassioned pleas to local homeowners to clear the snow away from sidewalks in front of their houses. Nice idea – doesn’t work. There’s always someone who can’t get busy. Here’s a suggestion. Use some public pressure. Our local residents’ associations should each write up a polite form letter to drop off at delinquent homes. Nothing aggressive or provocative, simply a reminder that neighbours and friends would appreciate proper snow clearing. Don’t miss the orchestra’s Christmas concert. 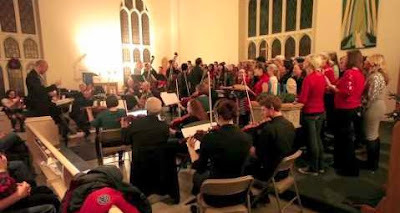 Thursday December 10 at 8 pm, Little Trinity Church (425 King E). $10, kids free. 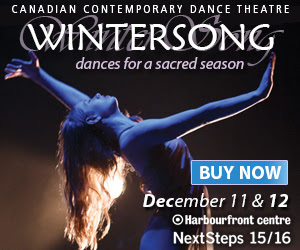 Dancers from the Canadian Contemporary Dance Theatre will perform WINTERSONG – dances for a sacred season. Friday December 11 (8 pm) and Saturday December 12 (2 pm) at the Fleck Dance Theatre in Harbourfront (207 Queens Quay W). The program includes Petits Reves, a premiere by renowned choreographer Sylvie Bouchard plus Incipit Vita Nova by Belinda McGuire. Tickets and more info here. 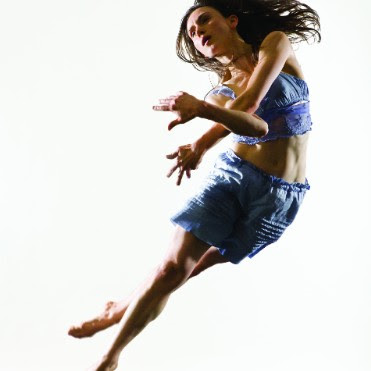 Toes for Dance is an annual festival of 60-minute dance productions at the Aki Theatre in the Daniels Spectrum (585 Dundas E). Belinda McGuire’s Three Muses is on stage on Friday December 11 and Saturday December 12 at 7 pm and on Sunday December 13 at 2 pm. Callahan Connor’s The Living Shhh follows at 8:30 pm and 3:30 pm on Sunday. A Q&A session and meet and greet follow the performances. Tickets are $23 to $35. More info and tickets available online here. Presented by the School of Toronto Dance Theatre. It’s an ambitious program of main-stage performances showcasing dancers from all three levels of the School’s professional training program. 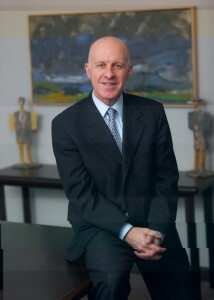 Works by Marc Boivin, Danny Grossman, Louis Laberge-Cote, Julia Sasso and Apolonia Velasquez. December 3 to 5, 8 pm, $20 and $15. Winchester Street Theatre (80 Winchester). Tickets are available online. Soulpepper’s popular production of its Christmas favourite, A Christmas Carol, starts on Thursday December 3 and runs to Sunday January 3. Tricks with David Ben and Patrick Watson starts on Saturday December 5 and continues to Sunday January 3. 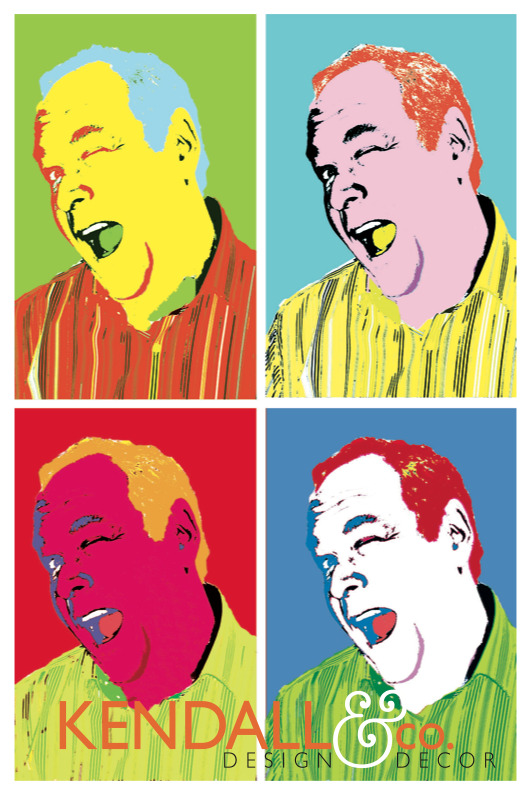 Dennis Lee’s Alligator Pie is on stage from Wednesday December 16 to Sunday January 3. 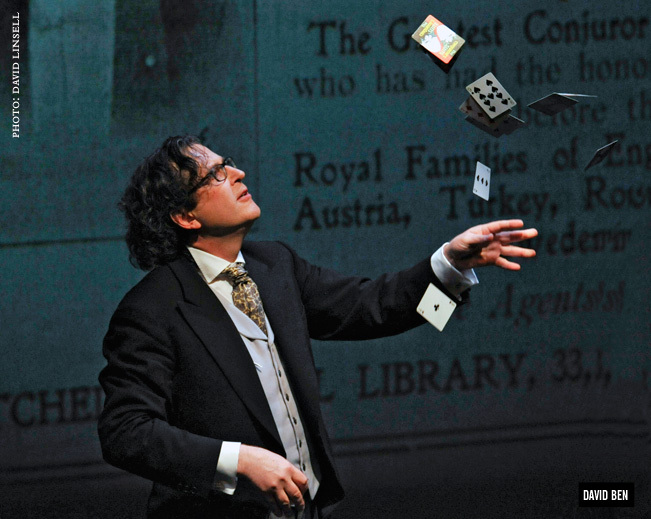 For program info and tickets, go to Soulpepper’s website. 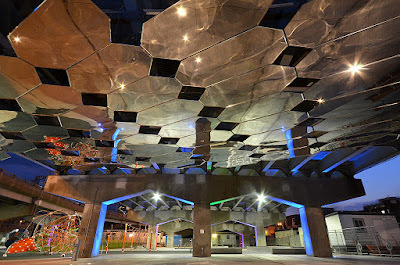 Distillery, 50 Tank House Lane. This event has become an annual Cabbagetown favourite. 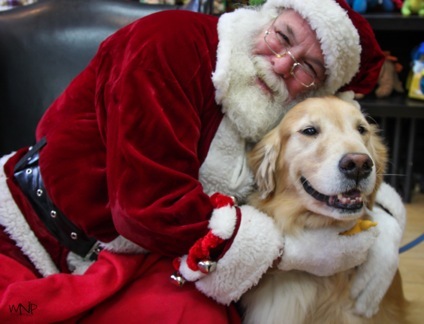 Bring your dog, your cat, your hamster or your gerbil to Pet Valu (240 Carlton) on Saturday December 5 and December 12 from 10 am to 2 pm to meet Santa and to be the star in a souvenir photo. Only $10. Saturday will be a busy day at Pet Valu (240 Carlton). Marilyn will be there as well for her monthly clipping clinic. $10. 9 am to 4 pm. 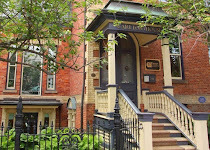 Popular Cabbagetown artist, Victoria Hadden, is again selling her greeting cards through Kendall & Co (514 Parliament). 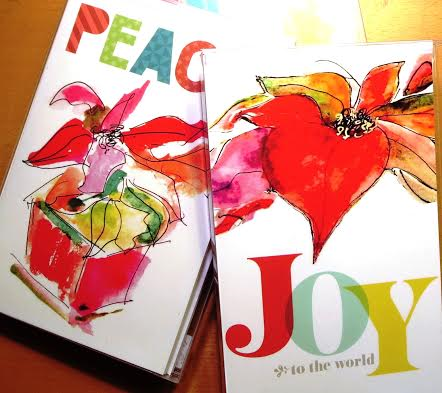 Her colourful handcrafted cards are pre-stamped and ready to mail – just bring a pen and your address book. Jason McGregor, a realtor at HomeLife/Realty One (501 Parliament) is organizing this year’s food drive. 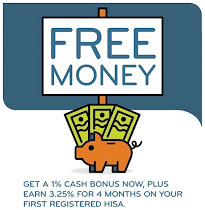 He’s combining it with a special draw to select the winner of a $100 VISA prepaid gift card. 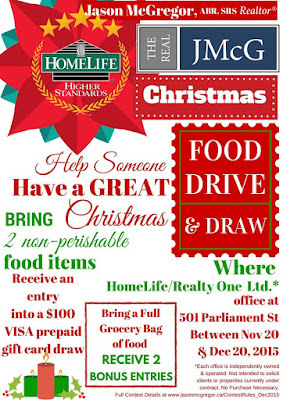 His system is simple – bring in two non-perishable food items and get one entry form for the draw. If you bring in a full grocery bag, you’ll get two bonus entry forms. You can do this once a day, every day. The drive runs to Sunday December 20. It’s part of the HomeLife campaign, “No Family Left Hungry”. 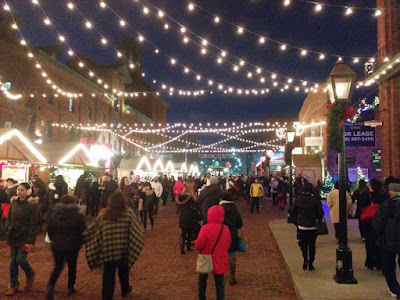 The Distillery’s big Christmas show continues through this week. The entertainment takes place all day with strolling carollers, Santa’s elves and children’s storytelling. Special events are staged daily from 6:15 pm. Multicultural performances include dancing, choral music and special performers. $5 admission fee on weekends. You can check out all of these details on the Market’s website. 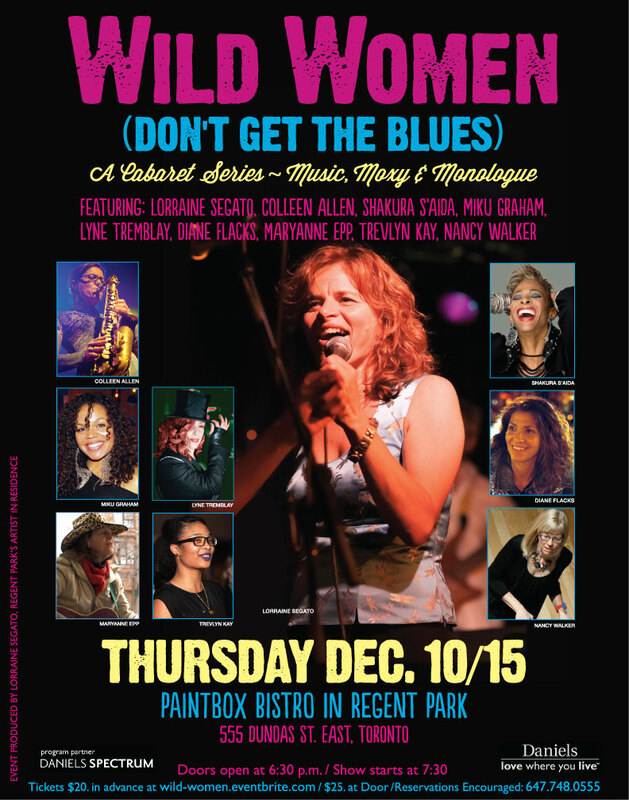 Lorraine Segato and her friends return to the Paintbox Bistro (555 Dundas E) with their cabaret, Wild Women Don’t Get the Blues, on Thursday December 10. Doors open at 6:30 pm and the show starts at 7:30 pm. 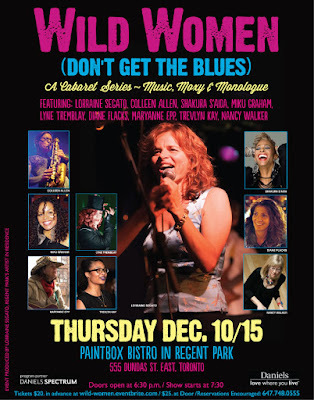 Appearing with her are Colleen Allen, Shakura S’Aida, Miku Graham, Lyne Tremblay, Diane Flacks, Marianne Epp, Trevlyn Kay and Nancy Walker. Tickets are $20 in advance and $25 here. Order yours online. The Local GEST’s annual Christmas sing-a-long happens on Sunday December 20 at 3:30 pm. 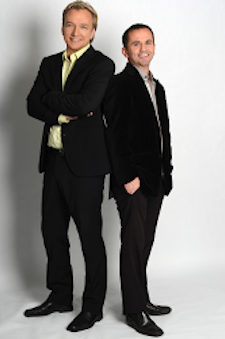 Join Jeff Barnes and Noah Zacharin for some melodic Christmas cheer. It’s always a packed house and a great time. 424 Parliament. 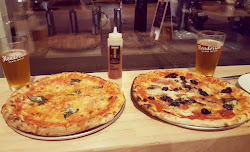 The renovated Dominion has opened its doors at 500 Queen E. There was a special soft launch over the weekend. 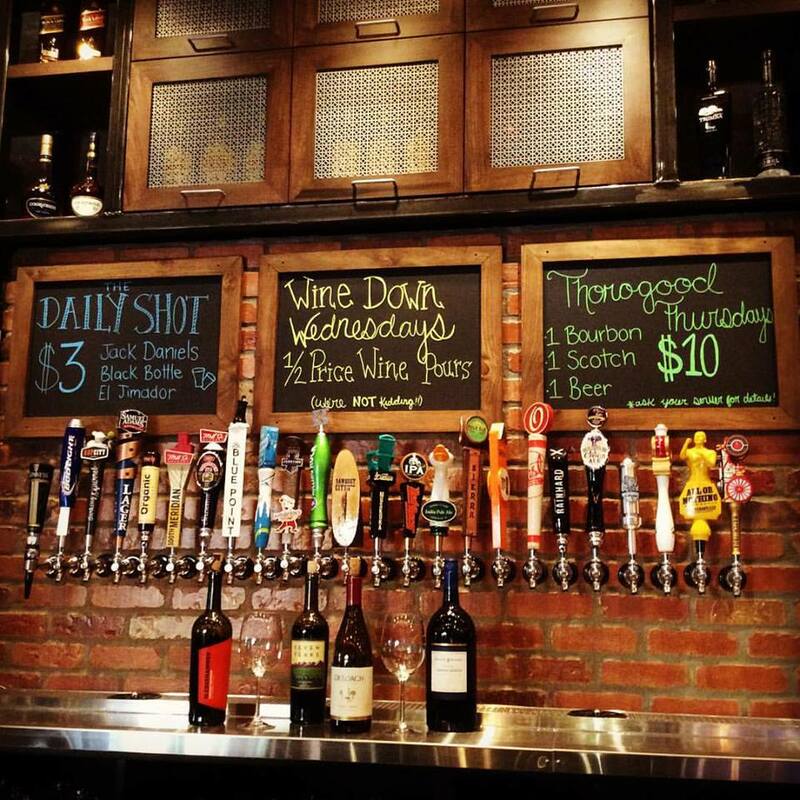 The new owners have announced that there’ll be 24 taps of craft beer, a daily $4 pour and a menu full of comfy pub favourites. Live music will return as well from Thursday through Saturday – on Thursday December 3, it’s the Nice Boys, on Friday, DJ FrankenSztein and on Saturday, DJ Tantrum. Check it out on Facebook. Game Night will be on Monday December 7 from 5 pm. 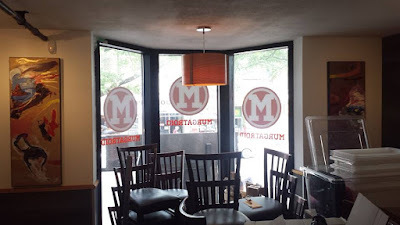 Bring your own game or enjoy one of Murgatroid’s. Great food for dinner or snacks. 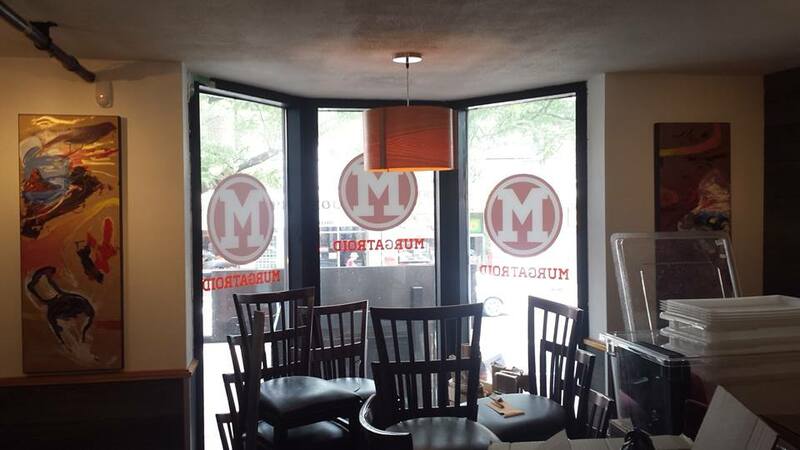 Murgatroid is now licensed. 568 Parliament. 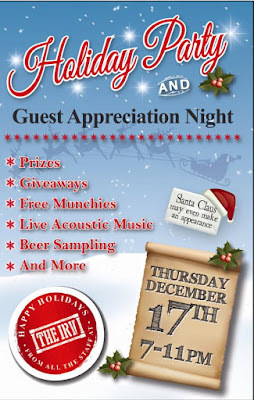 Guest appreciation night at The Irv (195 Carlton) happens on Thursday December 17 from 7 to 11 pm. It promises to be a blow-out. Live music, beer sampling, prizes and giveaways and free munchies. 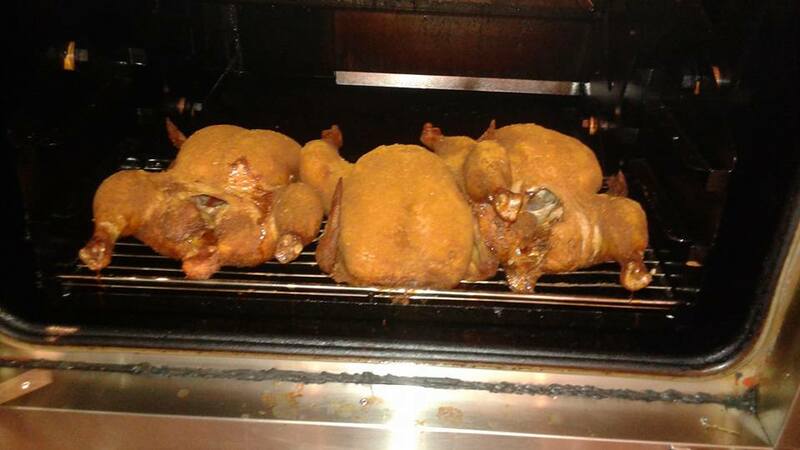 Make your holiday festivities a little easier with a smoked turkey from 420. 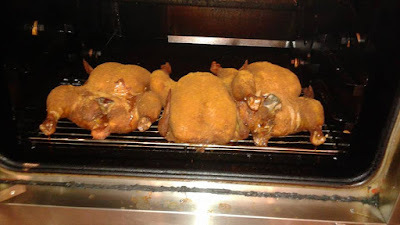 Your bird is soaked in brine for three days and then given 420’s own special rub before it’s smoked. 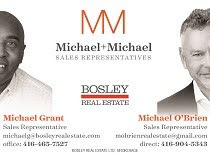 Contact Virginia at (416) 924-5858. 420 Parliament.